Last week on the KSKQ radio version of “Literary Ashland” Michael Niemann and I interviewed Tod Davies. You can listen here. 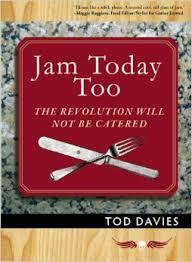 Tod Davies is the author of Snotty Saves the Day and Lily the Silent, both from The History of Arcadia series, and the cooking memoirs Jam Today: A Diary of Cooking With What You’ve Got and Jam Today Too: The Revolution Will Not Be Catered. the latest on the Weisinger Family Winery has begun a monthly series of literary presentations featuring authors from the State of Jefferson, Friday Words and Wine. Next up: M J Daspit reads from Lucy Lied on September 19.
on September 5 from 7-8, Bloomsbury Books in Ashland, will host a reading by Port Townsend poet and memoirist, Sheila Bender, and Jonah Bornstein, of the Ashland. Sheila’s memoir, A New Theology, explores poetry as a path to healing from loss. Rumor has it that Jonah will unveil a portion of a memoir-in-progress. Friends of the Ashland Public Library invites you to a reading by Peter Sears, Oregon Poet Laureate on Friday September 12 from 7:30-9pm in the Ashland Public Library. Free and open to the public, Sears will read from his book, Small Talk: New and Selected Poems published by Lynx House Press in 2014. Chautauqua Poets & Writers invites you to a workshop by Peter Sears, Oregon Poet Laureate called “Ways of Revising” Saturday, September 13, 2014, 9:30 to 11:30 am at the Ashland Public Library. The Cost: $20 and it’s limited to limit: 20 participants. And don’t forget the Ashland Book and Author Festival, September 20 at the SOU Hannon Library. We’d like to recognize the passing of Kay Atwood who died on May 26 this year in Ashland, Oregon. Atwood was much loved for her scholarship and writings on regional history. Her many works include Illahe: the story of the Rogue River Canyon, Blossoms and Branches: A Gathering of Rogue Valley Orchard Memories and Mill Creek Journal, a history of Ashland, Oregon. Atwood’s last work was Chaining Oregon published in 2008. Edwin Battistella’s latest book Sorry About That: The Language of Public Apology was released by Oxford University Press in June of 2014. This entry was posted in Literary Ashland Radio on KSKQ. Bookmark the permalink.